For seeding a new area, roto-till Nature’s Yield Compost into the top 4″ of your soil. Cover the grass seed with approximately ½” of Nature’s Yield Compost. Spread Nature’s Yield Compost for use as a Top Dressing approximately 1/4″ thick across your lawn. Keep seed damp until germination occurs, which should approximately 7-10 days depending on seed variety. See EKO Top Dressing for a product that has all of the same benefits, and is screened to a smaller size for easier top dressing applications. Mix Nature’s Yield Compost thoroughly into your existing soil at a ratio of 1 part Nature’s Yield Compost to 2 parts native soil. When planting or transplanting trees and shrubs after the dirt has been removed from the desired planting location, place Nature’s Yield Compost in the bottom of the hole to a 2” depth. Place your tree or shrub in the prepared area. Mix 1 part Nature’s Yield Compost with 2 parts native soil and fill in around the root ball of the plant. Nature’s Yield Compost to heavy clay soils improves drainage. Nature’s Yield Compost has spaghnum peat moss blended in to increase the moisture holding capacity. Nature’s Yield Compost will slowly release plant nutrients. Helps decrease chlorosis (yellowing of leaves due to iron deficiency). Fruit trees will bare more fruit, bigger fruit, and better tasting fruit. Flowering trees will produce bigger, more colorful flowers. Nature’s Yield Compost is 100% Organic. It is thoroughly cured compost. Products that are only partially decomposed can actually reduce the amount of Nitrogen available to your plants, because the micro-organisms will use the nitrogen to finish decomposing the material. 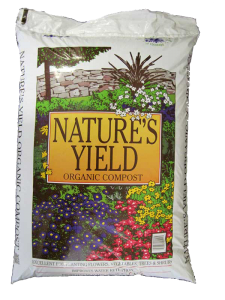 Nature’s Yield Compost is blended with spaghnum peat moss for added moisture retention. Nature’s Yield uses untreated wood products for a carbon source. It has a consistent mix due to its carefully controlled quality ingredients. Micro-organisms are an important part of the composting process. Micro-organisms convert the carbon into energy for their own growth. They recycle the nutrients from decaying material into their own bodies and eventually back into the soil. Your plants use the nutrients stored in the micro-organisms for food, and the process starts over. Nature’s Yield Compost may be used as a mulch on the surface of the soil around your plants. Helps increase root zone temperatures resulting in improved root growth. Adds organic matter to the soil. A high carbon to nitrogen ratio is important in determining how easily bacteria can decompose organic matter. The micro-organisms in Nature’s Yield Compost use carbon for energy and a nitrogen source for protein synthesis. High salt content soils can wither plants. The pH of Nature’s Yield Compost as measured by independent lab analysis is 7.2. This is considered to be a neutral pH level. High pH is considered to be alkaline, and low pH is considered to be acidic. pH that out-of-balance can negatively affect the uptake of nutrients by plants.